Looking to 'divert' funds from your company, charity or government department? It can be frustrating when, despite having a responsible position in a thriving concern, you just can't seem to get your hands on any of that sweet, sweet cash. The traditional way of siphoning off the moolah is to commit your organisation to shelling out on a new information system, brand image or similar piece of corporate fluff, then farming the project out to whichever company promises you the biggest kickback. It's effective, but there is always the risk of troublesome questions about unwarranted expenditure from shareholders, trustees or elected members. Not to mention those hard-to-shift suspicions about what you personally may be getting out of the deal. Well now there's a new product to set your mind at rest. Adding Rinse EasyTM to your tender process will wash away all those irritating objections and awkward questions, and leave you free to enjoy your ill-gotten gains without a stain on your character. 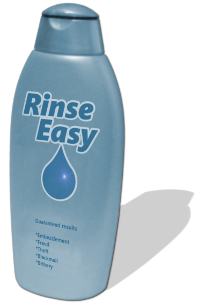 Special Offer: Order 12 cases of Rinse Easy today on your corporate account and we'll give you 30% back... in cash. I think we understand each other, yes?